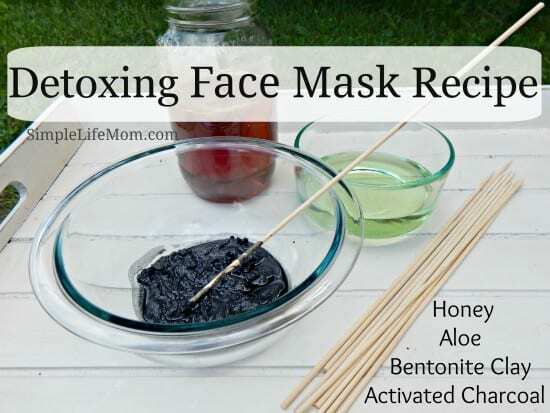 It’s well understood now that our skin is our largest organ and it does absorb toxins from around us, so what better way to cleanse our pores than with a Detoxing Face Mask Recipe. Those of you who have been around me for a while know that I always like to include some research with my recipes whenever possible. There are so many recipes, tips, and tricks that are thrown around on the internet that it can be hard to know what really does a good job and what is just being copied and perpetuated through this lovely technology we now have. Why a Detoxing Face Mask Recipe? The fact is that we do absorb toxins from the foods we eat, what we put on our bodies, what we breathe in through air or water vapor in the shower…We were designed to handle toxins at a normal level found within nature. Even then, we sometimes need a boost, which is where great foods come into play as great medicines. Yet, now we are faced with an age of chemical saturation in every direction we turn. Our food has preservatives and other toxins, pesticides. Heck, even our feminine products have certain levels of toxins. Our bodies will take these toxins and filter them in many ways; from the liver, kidneys, spleen, to your lymphatic system. Your lymph nodes are throughout your body. These nodes are like a cleaning factory. I first learned about them when my armpit lymph node swelled to golf ball size from the deodorant I started using as a teenager. Sometimes they have a difficult time keeping up and can become bogged down and even swell. This is one reason why I put together a clay deodorant recipe with bentonite clay which draws out impurities. You have lymph nodes in your face as well: by your ears, in your throat (tonsils), under your tongue, etc. All of these work to clean your blood of toxins. 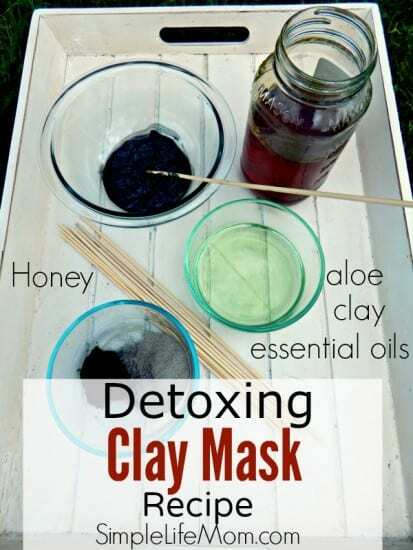 Well, let’s help them out with a great detoxing clay mask recipe! Bentonite Clay is a sedimentary volcanic ash that swells when it comes in contact with water. “Once it becomes hydrated, the electrical and molecular components of the clay rapidly change and produce an ‘electrical charge’.”1 It is this negative electrical charge that will bond to the positive charge of toxins, absorbing them into the clay as it releases its nutrients. A detoxing face mask recipe wouldn’t be to its full potential without some amazing, healing essential oils, right? Before using any of these oils, please take a few minutes to read through Essential Oil Safety guidelines. You’ll get more bang for your buck and make sure that you are doing the best for your particular skin type. Some oils that do well with some may cause allergic reactions in others (e.g. lemongrass). Others can be more irritating (why I mention cinnamon leaf instead of cinnamon bark). What a friend can use neat may be highly irritating to you. Always dilute, and always test on your wrist before applying to the entire face. Combine all ingredients in a glass or plastic container and stir with a wooden or plastic spoon (you don't want the clay to react to the metal in your spoon - you want it to bond to the metals in your body, removing them from your skin). Massage onto face and neck. Charcoal can stain so keep clothes away! Wear for 15 to 20 minutes and then rinse with warm water. You can play around with the amounts to get the consistency that you love. Again, before using any of these oils, please take a few minutes to read through Essential Oil Safety guidelines. You’ll get more bang for your buck and make sure that you are doing the best for your particular skin type. Make sure to check out my Anti-Aging Clay Mask Recipe as well. DIY beauty products are the best and love this recipe. I’ve been trying to use more all natural products and I prefer to make them myself since they can be pretty expensive! Definitely going to give this a try. Thanks for sharing it! You’re welcome Corinne. Thanks for stopping by. Let me know if you’re looking for something you can’t find. Just started getting really into diy beauty care items. Love this, def need to try it. Thanks for sharing. Found you @ Our Simple Homesteading party. Love the recipe! I’m a huge EO fan and I’d like to learn more about bentonite clay and activated charcoal! I literally know nothing about them! 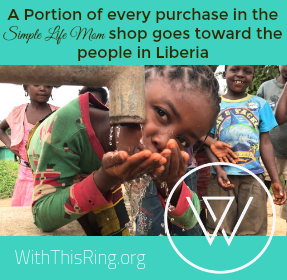 Thanks for sharing & for linking up to Favorite Things Friday with Simply Rachel & Hip Homeschooling! I haven’t used a face mask in a long time. This would be a great treat. I’m sharing! 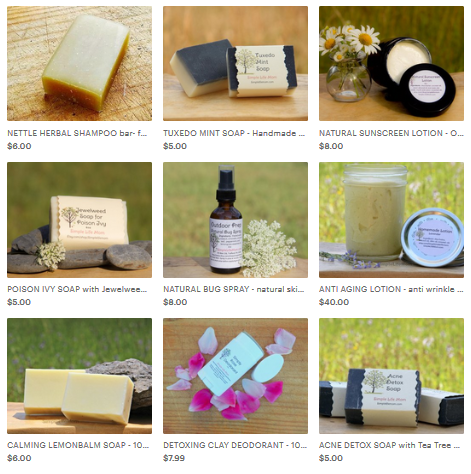 I love how you incorporate so many essential oils into your beauty routine! Detox mask recipe is great but do hope that there are some cautions for the anti-bacterial oils i.e cinnamon and clove as they are highly irritating to the skin since they have a lot of phenolic compounds in them. Hi Deb. Thank you for your comment and concern. I have a link to my essential oil safety guidelines page, but I’ve now put it in twice and added a safety statement. Thanks again. Can I mix all ingredients in a container and apply to my face later? Yes, you may want to leave the aloe out. It will last a lot longer without the water. With the aloe, do not keep more than 2-3 weeks.